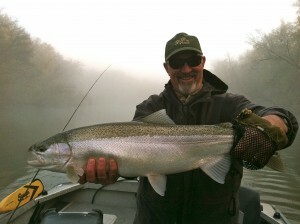 My brother and I booked a steelhead center-pin trip with Larry for my father’s birthday. After talking to Larry many times over the phone he was very accommodating. During our trip we found ourselves saying “wow this guy works hard for fish”. His knowledge of the river and ability to adapt to conditions was astounding. Even though the action was a little slow we still managed to catch a fair number of fish and just being on Larry’s boat and listening to his stories kept us entertained. He was able to put us on fish whether they were willing or not. We had an incredible time with Larry and can’t wait to fish with him again. I’ve got a feeling that Premier Angling is about to gain a lot more Canadian clients! I recommend him to everyone. Larry was our guide this past September while my husband and I celebrated our anniversary. 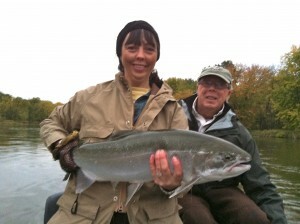 It was our first time ever fishing for salmon and Larry made sure that our experience was nothing short of amazing. Right from the get go he was great to talk to and has a magnetic personality. When I first spoke to Larry I told him that I had never caught a big fish and have always wanted to. With a slight chuckle he assured me that we would take care of that. On our fishing adventure, we certainly did just that. 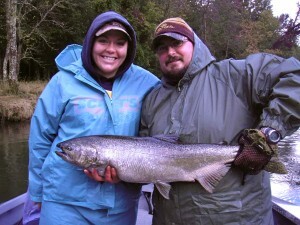 We caught some beautiful king salmon and I had definitely caught my big fish. When we landed every fish I felt he was just as excited as we were. Throughout the day he answered questions, coached us how to reel them in, and taught us both a lot. His gear is in pristine condition, the boat is clean and comfortable and the ride down the river is a blast! He is concerned with the preservation of the fish while at the same time making sure that you are having a great time. After our trip with Larry, my husband and I are already planning to make this part of our annual anniversary vacation. We are already looking at the calendar for next year! 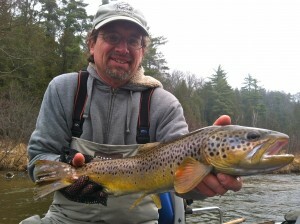 Larry Raney is an exceptional guide and you’re guaranteed to have a great time with him from start to finish. Thanks a ton Larry! See you in September! I met Larry Raney 10 years ago and book several floats with him a year. I keep coming back for several reasons. First and foremost, Larry shares the same passion and enthusiasm it takes to catch fish and Larry knows how to catch fish! From the moment I stepped on to his boat, I had the impression he was on a mission. He takes great care of his gear and keeps the boat clean and efficient. Being bashful is something Larry is not. Larry is not afraid to speak up to help me cast better or how to present the fly, thus helping me be a more successful fisherman. Fishing with Larry has developed into what it is like fishing with a long time fishing buddy or one of my brothers. It has been an absolute blast and taking that 3 ½ hour trip north seems like nothing; I know I am at least going to have a great time, with the benefit that I am probably going to catch a few fish. Keep up the good work, Larry. October has come to mean a trip to Wellston, Michigan….fishing for steelhead; hunting grouse; generally enjoying the outdoors with our regular group of guys on a trip that always leaves us wanting to come back. My experiences with Larry have been expanded to twice a year now to include a June trip with my twelve year old daughter. 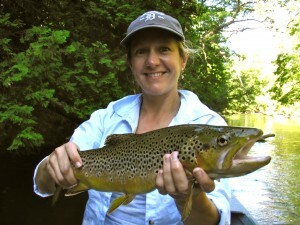 We fish for trout, enjoy each others company, and generally have a great time in the outdoors. Lily will be going back with me for our fourth trip this year. I can see some great memories being made on these trips! Larry makes both of these trips…as different as they are…fun and always fresh. He has a knowledge of the river and it’s always changing complexities that keeps us interested and feeling a “part of” the experience. I appreciate his true enthusiasm to catching fish as well as the fact that at the end of the day, it’s about having a good time out on the river with each other. Paying attention to “little things” like calling us in Indiana the week before the trip to ask Lily what she wants for lunch when we’re fishing…have made Larry and Lily true fishing buddies! Both trips are great! Can’t wait to head north again! I first met Larry about 15 years ago at a Spey Casting class. He was one of the class instructors. We hit it off and in the ensuing years we have become not just a client- guide but good friends. A day on the water with Larry is more than just a fishing trip. It’s an opportunity to learn or enhance your skills. 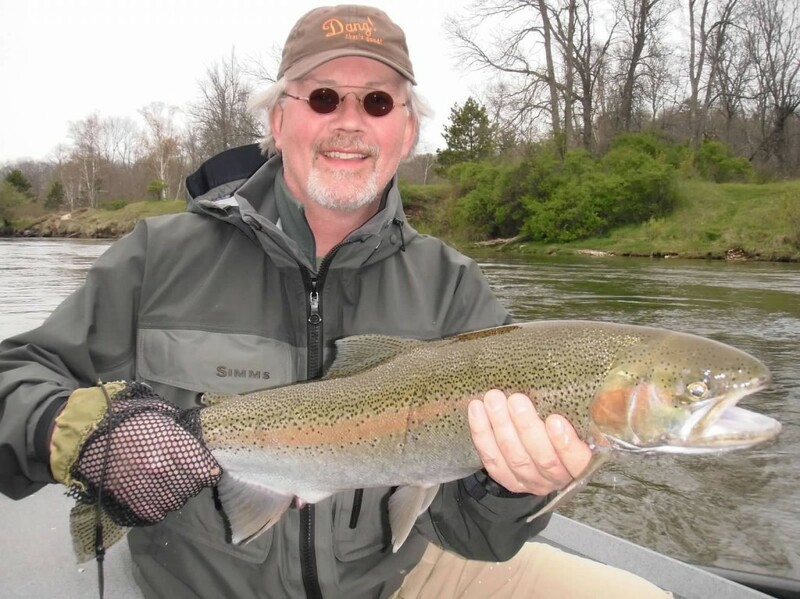 Be it Spey fishing, Dry Fly fishing, or fishing floats with a Center Pin, Larry can guide you to perfect your craft. 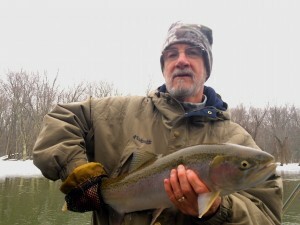 I fish with Larry Raney a few times every year and have hit trout, steelhead and smallmouth with great success. He has some of the best knowledge regarding fishing the local area that I have seen and keeps a tight, clean boat and tackle. I think this boy is always on the river fishing and trying out new techniques and patterns. 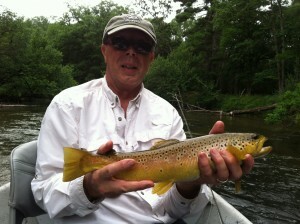 This experience he then uses on his trips to allow clients to have a great day on the water. 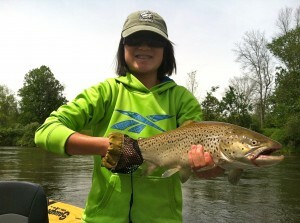 My fishing partners on these trips have included both novice and experienced fly fishers. Somehow Larry manages to read folks quickly and can determine a teaching style that fits their personality. He is patient, firm, yet never too intimidating with beginners. But he will step up and firmly challenge the more advanced fisherman to improve their cast or learn a new technique if he thinks they are ready. I think he is especially good working with women who fly fish. Fishing with Larry is all about hooking into fish and having a great time in the boat…but it’s also about improving your overall fishing skills so you can succeed in other locations and environments. I always walk away with a smile on my face, great memories of a fun day on the water, and a new skill learned. 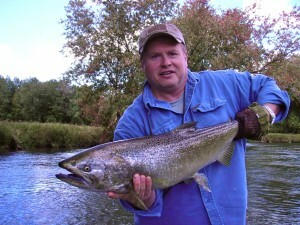 Last summer was the double haul….this summer will be spey casting….I cant wait! My wife and I have fished with Larry as our guide for just over 15 years. We have fly fished for a variety of species in the United States, Canada, Mexico, and the Caribbean. We have yet to find a guide that equals Larry. Whether you are an experienced or a beginning angler, Larry is extremely helpful in setting up your casts both in terms of the water, but also your abilities to maximize your day. He is an excellent fisherman, and shares his skills with you to improve your abilities. Even when the “bite” is flat, Larry’s knowledge of the water and fish pays off, trying different areas and techniques which pay off. 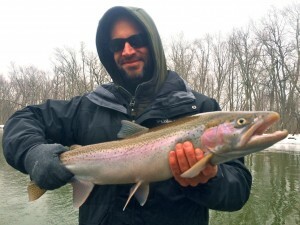 He goes above and beyond the ordinary to make your fishing trip pleasant and successful. Every trip we have had with Larry has been a great time, and we always look forward to our next adventure! Knowledge: Larry is at the very top of his profession; he is the gold standard for fishing guides. 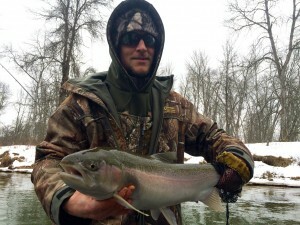 He guides about 200 days/year, but in reality, he fishes the river systems 300+ days/year. He does this because he truly loves to fish, because he knows the rivers are dynamic and constantly changing, and because he expects himself to be completely up-to-date and knowledgeable regarding the rivers, the fishing conditions and, over time, your angling skills. Work Ethic: Larry has a prodigious work ethic. What that means is while other, more average guides may be content to change locations on the river 2-4 times/day, Larry will literally drive anywhere over miles of river seeking optimal fishing conditions – and, he will put you on fish. Teacher: Larry possesses encyclopedic knowledge – period. More importantly, he constantly and endlessly shares his knowledge with his clients. The result: as the consumer you continually improve your technical skills, your knowledge base and your ability to put fish in the net. Fun Factor: Larry always makes the day, the experience and the relationship fun. Because Larry absolutely loves what he does, his infectious enthusiasm and unbridled joy shine through all day, every day irrespective of weather, fishing conditions or the number of fish landed. Larry is totally absorbed with doing everything within his power to make sure you have a great time on your trip. In my experience, there is a no more knowledgeable, hard working, skilled, customer-oriented or better prepared guide than Larry Raney. He is, without question, not only “the right” guide, he’s the best damn guide around. You might come close if you selected another guide, but, you certainly can’t do better.